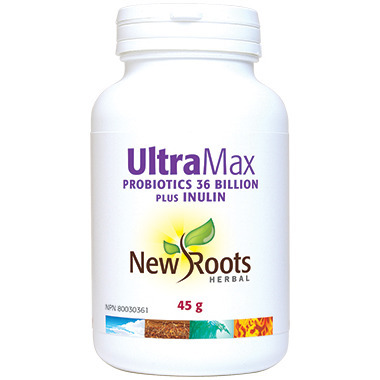 UltraMax powder is a blend of 11 probiotic strains with 36 billion active cells. These microorganisms prevent the development of putrefactive bacteria in intestinal diseases. UltraMax boosts the immune system and replenishes intestinal flora. Children 6–12 years, adolescents, and adults: Take ¼ teaspoon in cold food once daily or as directed by your health-care practitioner. If you are taking antibiotics, take this product at least 2–3 hours before or after them. Contains no: Preservatives, artificial colour or flavour. Cautions and warnings: Consult a health-care practitioner prior to use is you have nausea, fever, vomiting, bloody diarrhea, or severe abdominal pain. Discontinue use and consult a health-care practitioner if symptoms of digestive upset (e.g. diarrhoea) occur, worsen or persist beyond 3 days. This product has come into contact with milk and soy. Do not use this product if you have a milk or soy allergy. Contraindications: Do not use if you have an immune-compromised condition (e.g. AIDS, lymphoma, patients undergoing long-term corticosteroid treatment). Other ingredients: Vegetable magnesium stearate, potato starch, ascorbic acid, inulin (33 mg), and arabinogalactan (33 mg).